What is this! Well folks, as a youngster I recall mother and grandmother oft’ referring to their beautiful 1847 Rogers Bros. silverware serving sets as flatware. 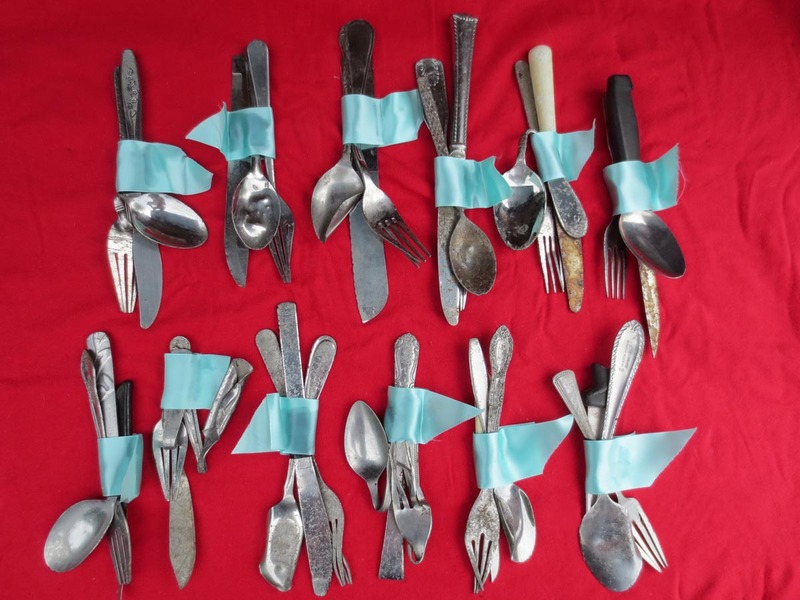 So, quite awhile back, and after passing flattened and mangled utensils (mostly spoons) laying the road shoulders, I got the bright idea--why not start your own “flatware” collection old man? And that’s exactly what I did! You might ask: What’s the difference between the beautiful silver service sets my mother and grandmother had--and the unusual set on display here? Well, in my collection, the knives, forks, and spoons are really and truly flat, the result of constant highway hammering. Over the many years of trekking the highways and byways of our great nation (thousands and thousands of road miles), I’d managed to pick up enough pieces to complete a lovely serving set for eight, with additional, incomplete sets for twelve.